This authentic 20 Franc gold coin is often called the "Helvetia". Has a cross and shield design on one side. Contains 18.67% of an ounce of gold in each coin. About uncirculated to un-circulated condition - very attractive! Add a some of these genuine gold coin beauties to your collection. We'll pick you a nice one from our inventory. Dates of our choice. Not bad for a genuine gold coin about 100 years old. Design of front and back. France! 18.67% of oz of GOLD! This is a French 20 franc GOLD coin made between 1899 and 1914. This attractive coin was made prior to World War I and was a popular gold coin at the time. DATE is our choice. Contains 18.67% of an ounce of gold in it. 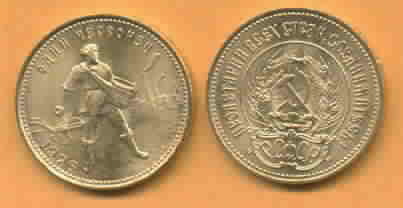 (Almost twice that of the US $5 1/10th eagle coin.) About 21 mm in diameter. Depicts a rooster design on one side and an ornamental head on the other. Our current inventory is very nice - in nice about uncirculated to un-circulated condition. Guaranteed Genuine..... and as always your Satisfaction is Guaranteed or you may return it for a full refund! Made by the government of FRANCE almost 100 years ago. Nice condition and price for a genuine gold coin about 100 years old. GOOD FORTUNE Coin from CHINA ! This is a BRILLIANT UNCIRCULATED 1/10th ounce GOLD COIN from CHINA. Called the Chinese GOOD LUCK or GOOD FORTUNE coin because of its symbolic design. One year issue. Made just for the year 1997. Contains a full TENTH OUNCE of 99.9% PURE GOLD! See our comparably prices Philharmonic and Maple Leaf gold coins. Wreath on reverse - 18.67% of oz of GOLD! This is a French 20 franc GOLD coin made about 150 years ago. Dates vary. Contains 18.67% of an ounce of gold in it. (Almost twice that of the US $5 1/10th eagle coin.) About 21 mm in diameter. Depicts a Napoleon the 3rd on one side and a wreath on the other. Coins have a touch of wear, however they are still in nice Very Fine or better condition. Genuine.....and as always your Satisfaction is Guaranteed or you may return it for a full refund! 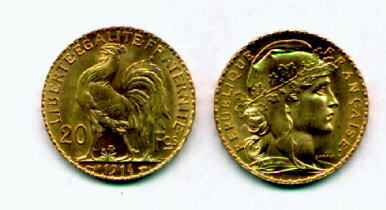 Minted by the government of FRANCE aver 100 years ago. Extremely Fine to About Uncirculated condition. Each coin contains 23.04% of an ounce of gold. We'll pick you a nice one from our inventory. Dates of our choice, all will be prior to World War I. As a major gold producer Russia produced these Chevronetz gold coins weighing 8.6 grams. Like older US gold coins they are 90% pure gold. Size is about 22-23mm (7/8 inches) in diameter. See scan of front and back. * Each coin contains the equivalent of 24.89% of an ounce of pure gold. Shop and use PAYPAL to pay with your Visa or Master Card. Or, you may email us your order and mail payment with a money order, cashiers check, or personal check. Thanks!